Communion tokens were a familiar feature of Presbyterian worship in past centuries. John Calvin suggested that tokens be used "to prevent the profanation of the Lord's Table." Huguenots in France and Presbyterians in Scotland began following Calvin's advice by 1560. Only those instructed in the Reformed faith were given tokens for admission to the Lord's Supper, and no one without a token was then allowed to take communion. The use of tokens took deep root in Scotland and Northern Ireland, and was brought to colonial America along with other communion practices from the "old country." 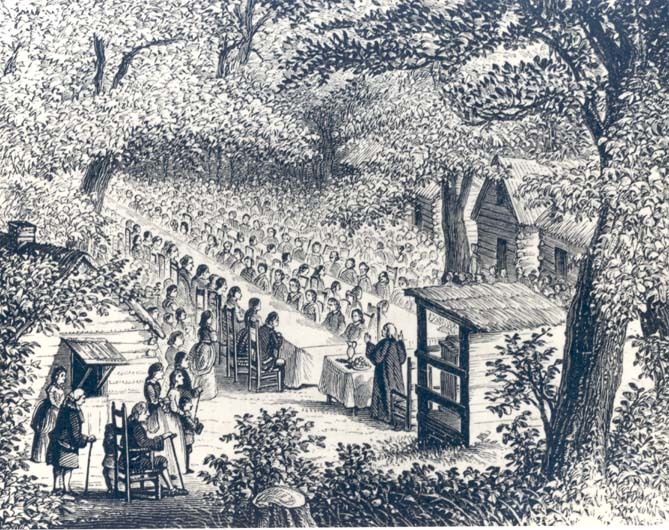 Most colonial congregations celebrated the Lord's Supper once or twice a year as part of a three to five day series of services called the "communion season," a forerunner of later camp meetings and revivals. Often several congregations joined together and, because of the large crowds, held services outdoors. A day or more before the communion service, the minister and elders questioned the members of their congregation about their beliefs and behavior. Only those who showed adequate knowledge of the faith and were deemed to be living upright lives received tokens. During the communion service, communicants came forward and sat at long tables where they turned in their tokens and received the elements. Most tokens were cast or stamped out of lead or pewter, but other materials were used including brass, copper, silver, nickel, zinc, ceramic, wood, printed paper, and later even celluloid. In the Presbyterian Church in the U.S.A., the use of tokens began to decline after 1825. By 1860 most congregations no longer used them. Churches that were more conservative in worship-such as the United Presbyterian Church of North America and the Reformed Presbyterians-often used tokens into the late 1800s and early 1900s. In recent decades many churches have minted tokens for special services such as bicentennial observances. Tokens of the 1700s tended to be plain--even crude--and were marked with initials of the church's or the minister's name and sometimes with a date. 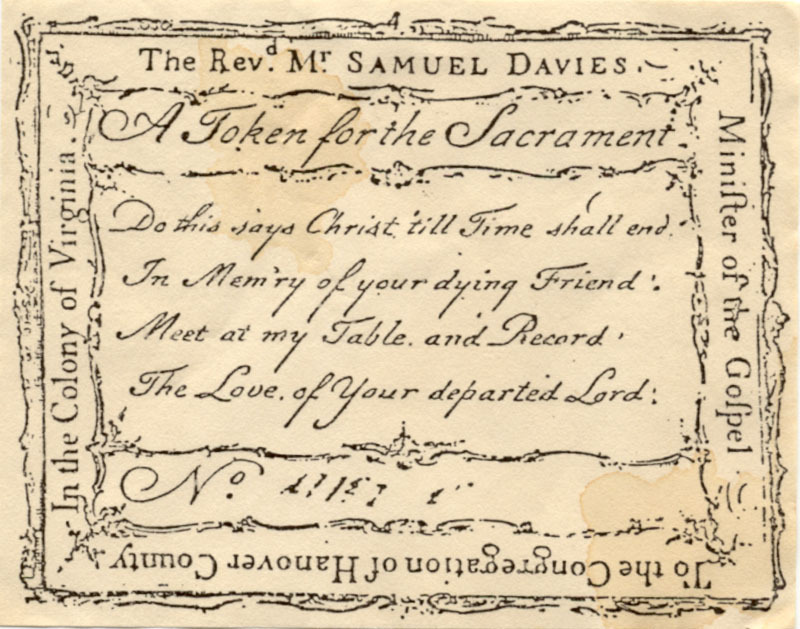 An exception is the card token used by the Reverend Samuel Davies in his Virginia congregations, one of the few known paper tokens of that era. In the 1800s some churches still used simple designs characteristic of the previous century, while others adopted a wider variety of materials and more elaborate designs, sometimes including Biblical references and symbols. By 1900 churches that still used tokens had largely replaced metal tokens with cards. In the 1970s and '80s many churches revived the token as a souvenir of an important anniversary or for other special celebrations. Designs range from simple colonial styles to elaborate medallions. Communion Tokens and Early American Communion Practices. Bason, Autence. Communion Tokens of tile United States of America. Privately printed, 1989. Ramsey, David & Craig Koedel. ''The Communion Season: An 18th Century Model." Journal of Presbyterian History 54 (1976): 203-216. Schmidt, Leigh Eric. Holy Fairs: Scottish Communions and American Revivals in tile Early Modern Period. Princeton, N.J.: Princeton University Press, 1989. Tenney, Mary McWhorter. Communion Tokens: Their Origin, History, and Use. Grand Rapids, Mich.: Zondervan Publishing, 1936.